Ethel Brooks was in her early 20's when she was recruited and trained by SCLC. She lived with her son, Jesse, and parents Jesse and Margaret Brooks in Coy, Alabama. 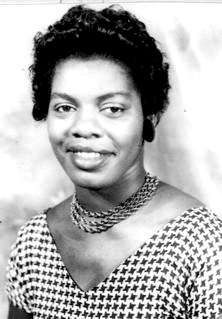 Ethel Brooks organized carloads of students to participate in the Selma marches including being chased off the bridge with them on Bloody Sunday. Ethel supported all of the student marches and boycotts. She was on the Wilcox County SCOPE field staff where we found her to be fearless, tireless, and impatient with anyone not ready to join The Movement. She always there for us. She had these pants — paisley pedal pushers — they call them "crops" now — that she called her jail pants. She said she could tell when we were going to be arrested, had a nose for it. Sure enough, a few days after we arrived, she was wearing her paisley pants while we were working on boycott materials at the church office and the sheriff rounded us all up and took us to the old jail. Ethel Brooks died tragically young in a solo car crash on a clear day when she was only 44 years old. Locals told us that they demanded an autopsy, but didn't find a bullet. 82-year-old Mrs. Rosetta Angion who raised 16 children and still found time to be a Movement activist summed up what many of us felt about Ethel Brooks. "Ethel Brooks? She was a young Harriett Tubman. Whatever she told us to do, we did it. If she came by and told a few of us 'I want you all to go walk across the Alabama River, I know you can do it,' we'd go do it."